On the 29th September 1939 the following people spent the night at the Residence of William and Annie Pearce (n. Tucker). 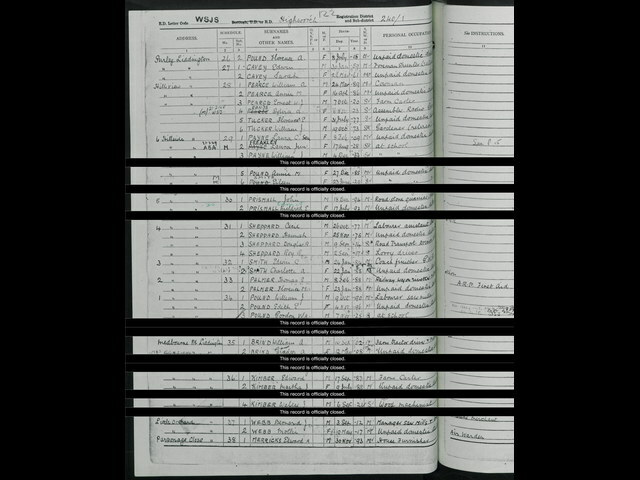 [S391] 1939 Register, findmypast & The National Archives of Great Britain, (findmypast), Ref: RG101/7156E/003/8 Letter Code: WSJS (Reliability: 3), 1939. [S346] England and Wales Births 1837 - 2006, Find My Past, Vol 5A Page 21 (Reliability: 3), 1923. See attached England & Wales Births 1837-2006 for Sylvia A Pearce. [S397] England and Wales Deaths 1837 - 2007, Register 38C, Engry No. 018, May 1997.